The N-Deavour has all the benefits you have come to expect from a caravan designed by The Little Caravan Company. If you want a small caravan and don't intended on travelling on rough and rugged terrain then this is the perfect Caravan for you. 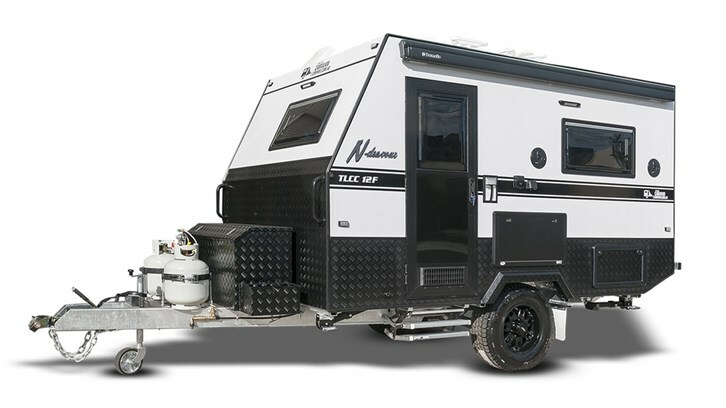 The N-Deavour has a shower/toilet, 2 single beds, internal and external cooking, fridge, ability to go free camping and not having to tow a big van or set up a tent then you have found exactly what you are looking for. 2 Single Beds, Shower, Toilet, Hot Water, Batteries, Solar Power, Indoor Dining, TV, Air-Conditioning, Internal Kitchen, External Kitchen, External Shower its all in there and at only 12ft it's easy to tow and a no fuss set up. At 'The Little Caravan Company' we aim to get everything into this layout of a 12ft caravan that we can. Our layout includes as much as we possibly get into the N-Deavour, however... Because we build everything in the factory and can customise the Caravan to what you need we can be easily swayed into creating a layout of your dreams, and making the N-Deavour a van you want! We have a huge range of options that you can change in your own 'Little Caravan' at no extra cost, so be sure to ask one of our dealers or call the factory direct to find out more.